Display Screen: 2.7 inches of TFT-LCD displayer (16:9) 270 degree rotation. Please charge the battery up to 8 hours the first time you use it! The lithium battery can be recharged up to 3000 times! This camera camcorder supports 1080p video resolution and 24.0 MP picture resolutions. It also supports 37mm wide angle macro lens, fisheye lens, and teleconverter lens and so on, which is optional and needs to be purchased separately. You can enjoy different visual effect of pictures according to your needs. 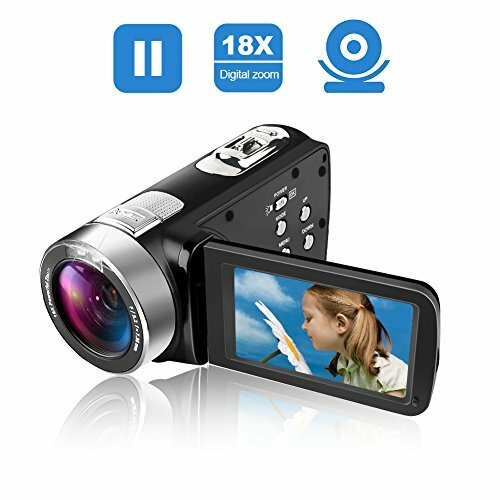 This is very nice 1080p camera which is easy to operate and you can take more pictures or videos at home or on trips. Being a HD web camera, you can use it for live video call when you set the USB as the PC CAM mode. It is easy to set and use. You can connect this camera to TV for live streaming by AV cable and it is in the standard package box. You can also play back the video or picture files recorded by this camera on TV. It's a light weight and small 1080p digital camcorder. It is a perfect choice for traveling, hobby recording and video blogging and so on. It supports 270 degree rotation for easy selfile. It has pause function so you can start a suspended video without recording a new one. Micro shooting can bring more fun and convenience, and the working distance is around 3.9 inch to 5.9 inch (15cm to 25 cm) with the help of wide angle macro lens which needs to be purchased separately. This camcorder can work for YouTube and Facebook and so on. It is quite easy to upload your video to these social media when you set the USB as MSDC mode. There are some good options to play around with like switch for your resolution, shooting mode, white balance, exposure and ISO adjustments and so on. One-year warranty is guaranteed by SUNLEA. Customer service is provided within 24 hours. You can use this video recorder when charging. The 1200 mAh Li-on battery can keep working around 60 to 90 minutes normally. It is recommended to charge it fully before use. The battery can be recharged up to 3000 times. Pouch bag is included for better protection and easy carrying. If you have any questions about this product by SUNLEA, contact us by completing and submitting the form below. If you are looking for a specif part number, please include it with your message.